Square du Vert-Galant is a small public garden located at the western tip of the Ile de la Cité. It was created in 1607 (at the same time than Place Dauphine) when two islets - Ile aux Juifs and Ile du Passeur - were attached to the main island. Square du Vert Galant is also still located on the original level of the Ile de la Cité, namely 7m lower than the island's current level! The newly created park was open to the public; women indeed came to wash clothes and collect water while men fished. It was turned into an open-air dancing area during the 19th century, but this site closed a few decades later due to recurrent floods! The City of Paris bought the land in 1884 and landscaped the public garden. A double flight of steps accessing the garden is located at the rear of the equestrian statue of King Henri IV on Place du Pont-Neuf. The current statue is a replica that dates from 1818. Henri IV was known for enjoying the company of ladies and was nicknamed Le Vert Galant (sprightly), hence the park's name! A little oasis of greenery and peace in the middle of the Seine! Square Vert Galant boasts prime views over the Samaritaine, Institut de France, Hôtel de la Monnaie and Louvre Palace. 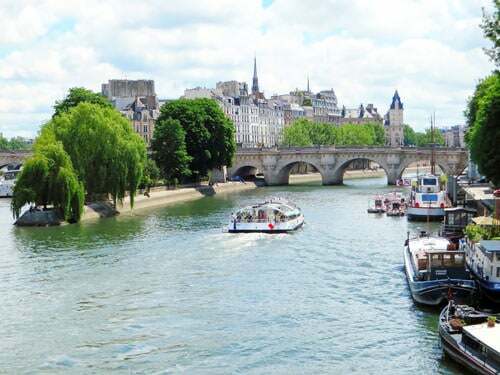 It is located right in the middle of the River Seine, away from the noisy crowds! The central lawn is nestled in an impressive selection of tree and shrub species. These indeed include several chestnuts, weeping willows, tamarisks and lilacs, a walnut bearing edible nuts, a maple and a Ginkgo biloba! If you are patient, you'll also see many aquatic birds such as swans and ducks. Finally, those who are fans of French history will discover a discreet commemorative slab. 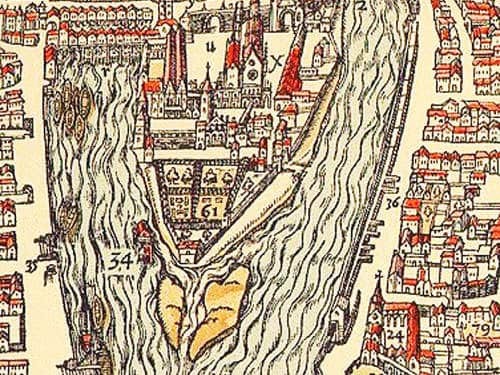 It says that the Ile aux Juifs was the place where Jacques de Molay, the Grand Master of the Knights Templar Order, and his lieutenant Geoffroy de Charnay, were burnt at the stake on March 1314. Travel France Online will use the information you provide on this form to keep in touch with you and to provide updates via our newsletter. By selecting the boxes on the form you confirm your acceptance to receive our newsletter.